Leptospermum is a genus of flowering trees and shrubs in the family Myrtaceae, which is native to Australia, New Zealand. Called "teatree" because Captain James Cook in the 18th century brewed a tea from the leaves and gave it to his crew as a scurvy preventative. These are substantial and useful plants all year round; soft and casual looking (never rigid or formal). Most make a display of five-petalled single flowers (somewhat like tiny wild roses) along stems among the small leaves. Petals surround a hard central cone or cup that matures to a woody seed capsule that hangs on for a long time after the petals drop. Flowers are typically white, pink, or red. 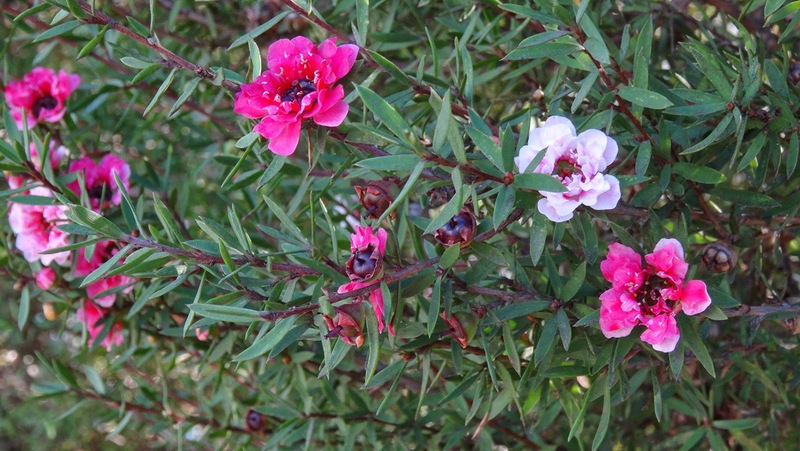 Leptospermum scoparium shown here is the double form, with light pinkish white flowers that darken as they mature. The species has many varieties, which are valuable garden plants, most growing from 1 to 3 metres tall and wide. Not as bold in form or as serviceable in hedges and screens as Leptospermum laevigatum, but the beautiful flowers are showier: Single or double, in white, pink, or red, profuse in spring and summer. Branches densely set with small needlelike green/burgundy leaves. Good in containers. I know only the oil (against ticks and for more other purposes), thanks for showing.